The blog hop starts right now and will run until the 18th of April. There are two prizes which means two winners!!!! 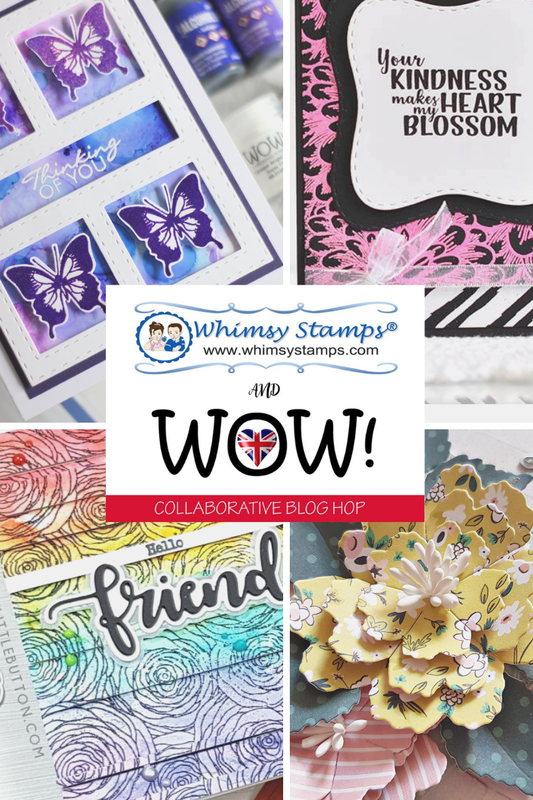 Great collaboration with Whimsy Stamps! I love their designs! Coupled with your pretty embossing powders, I know I am in for a treat! Great collaboration, I love both companies so this is awesome! Thanks for the giveaway. First I would like to say a big thank you for the opportunity to win one of these two great prizes. I am so excited to see what everyone will be showing today. Have an awesome weekend. What a wonderful collaboration! Thank you for the chance! I LOVE Wow Embossing powders! So many great colors! How cool is this Blog Hop - WOW! Embossing Powder and Whimsy Stamps??!! Yep, I am excited..... let the inspiration begin 😀. I am looking forward to seeing all the creations!! Looks fun, off to hop! I love blog hops, so many different styles and cards to discover! Fun collaboration...so many great ideas. This is going to be a great collaboration. Off to hop. Another great collaboration and looking forward to seeing all the designers creations. Off to Hop! Can't wait to see the creations on the hop. Loving everyone’s designs and inspiration! You two make a great team! Seen some great projects! I' m looking forward to the sights we woll see and the inspiration that awaits. Great giveaway--off to hop and be inspired. Wow! I'm so happy for this collaboration!!! Can't wait to see all the wonderful creations along the hop! Thanks for this chance to win!! !